Plastic 1 litre bottle of Monin Pure Sugar Cane (Pur Sucre de Canne in French) syrup. The sight of lush green sugarcane fields swaying in the breeze of a faraway Caribbean island is a vision of paradise. Cane sugar is derived from the sugarcane and harvested under the warm sunshine. 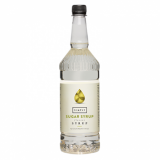 Monin is proud to offer Monin Pure Cane Sugar syrup, a premium simple syrup made from 100% pure cane sugar and filtered water. 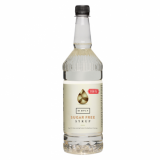 Monin Pure Cane Sugar syrup is a great substitute for regular sugar as it dissolves instantly in hot and even in chilled beverages, for incredible versatility in non alcoholic beverages and cocktails alike. Its aromatic power ensures an economic and tasty use. Taste: Sweet powdered sugar taste, no smell.